On way: Tommy Armstrong makes a break for Methody during their quarter-final win. 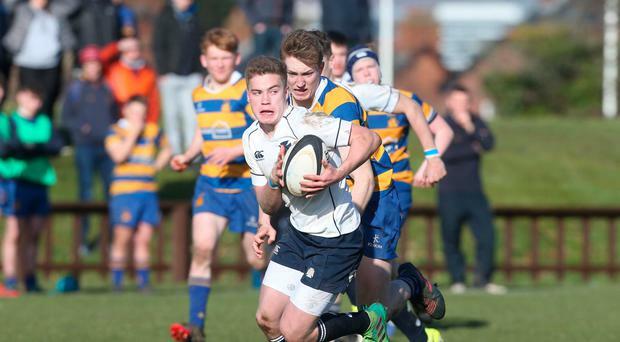 RBAI and Methodist College recorded convincing Danske Bank Schools' Cup quarter-final victories over Sullivan Upper 29-3 and Bangor Grammar 53-10 respectively, while Armagh Royal had to do it the hard way - in Lisburn against Wallace High 22-14. Inst captain and No 8 David McCann touched down after seven minutes for Robin McIlveen to convert and although they continued to dominate it was 23 minutes before centre Angus Adair added a second converted try. Just before the break Sullivan had a Conor McKee penalty. "Sullivan played much better after the restart and pressed our lines a number of times but were unable to break through," commented Inst coach Daniel Soper. "A break by McIlveen on our '22' resulted in winger Jamie Mullan crossing in the corner but Sullivan came back at us again," he said. "We had to be well organised but eventually won turnover ball and McCann ran in from 30 metres for McIlveen to convert and later add a penalty. "It was a tough workout. We created chances but couldn't finish. Sullivan came at us time after time but full credit to our defence. Methody coach Stevie Lindsay said: "A great team effort and difficult to single any players out but I thought half-backs Matt Neill and Thomas Armstrong were particularly outstanding." Methody were 36-0 ahead at the interval with five tries for Ethan McIlroy to goal four and add a penalty. Neill had the first following a break from a ruck 15 metres out before Connor Scanlon charged in from 10 metres. Conor Kelly had the next two following mauls and then a break by Chris Larmour from the back of a scrum on his own '22' led to a lot of inter-passing before John Fletcher dived over. Jonah Bingham scored the sixth from close range and Max Lyttle was next after breaking off from a maul. Larmour then cut through for Kevin McNaboe to add the eighth which Fletcher goaled. Zach Kerr and Ben McCrossan scored the Bangor tries. Wallace allowed Armagh to have the slope advantage in the first half and they made full use of it to take a 22-7 interval advantage. "We went in front after six minutes when forward pressure and an overlap saw Romain Morrow score for Zac Thompson to goal," said Armagh coach Willie Faloon. "'Thompson then kicked a penalty and later converted a Matty Rainey try after the centre broke through three tackles." Wallace had a couple of penalties which led to Nathan Doak converting a Sam Cardosi try. "Our crucial try came just before the interval after Wallace had been pressing our line. "Ryan O'Neill who was a star performer all morning created a turnover and the ball was kicked downfield for Thompson to make it 22-7. "We had to defend more in the second half," added Faloon.